Vitamin charts come in handy when you want to maximize your health, as vitamin deficiencies can impact energy levels, metabolism, bones, muscles, eyes, skin, mental alertness, immunity, and overall fitness. Vitamin charts help you know about each vitamin's role in your body, and how much you should be getting daily. The vitamin chart below shows a list of all essential vitamins and why it's crucial to get the right amount of each in your diet regularly. 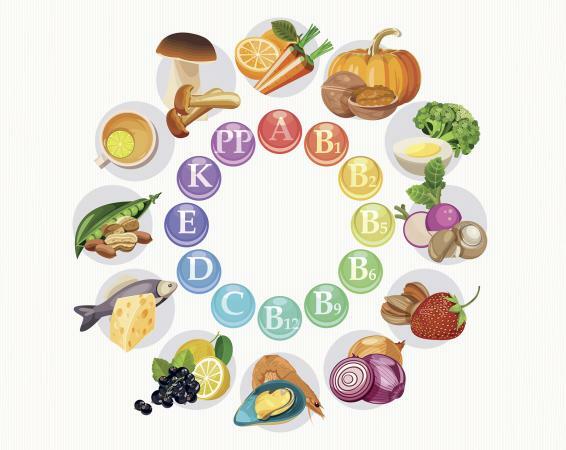 Each nutrient brings something unique to the table, while working in harmony with other vitamins and minerals. Keep in mind the chart below contains information for vitamins only, while minerals (calcium, iron, etc.) are just as important to maximize overall health. Needed for breaking down proteins (metabolism). Helps maintain central nervous system. Knowing how much of each vitamin (and mineral) to consume daily helps ensure you're not getting too little (or too much) of each essential nutrient. Keep in mind too much of a good thing isn't always beneficial. Some vitamins, like B and C, are water-soluble and tend to get flushed out in urine if you consume too much. Excess fat soluble vitamins (A, D, E, and K) can build up in your body, leading to unpleasant and even dangerous side effects. Bottom line: pay attention to recommended dietary allowances (RDAs), adequate intake levels (AIs), and tolerable upper intake levels (ULs) and talk with your doctor if you have vitamin deficiency symptoms that might require high doses of vitamin or mineral supplements. Vitamins affect nearly every cell and function in your body. Having proper vitamin intake allows your body to function optimally and understanding the benefits serves as a reminder that you need to eat a diet rich in vitamins to stay healthy.